A: Go to the Financial Aid Homepage and click on “How To Apply” for details on what you need to do. What is CCC's Title IV School Code? What documents do I need to complete my financial aid file? A: About a week after you have completed your FAFSA, we will inform you (by mail and/or email) of the documents necessary to complete your file. You can check your financial aid status on Self Service. Click on Financial Aid> Financial Aid Status> Select CurrentAid Year > view Unsatisfied Student Requirements to see what we need from you. What is verification and why was I “selected for verification”? A: Verification is a process initiated by the U.S. Department of Education or financial aid used to confirm that the information you entered on the Free Application for Federal Student Aid (FAFSA) is accurate. You will be required to submit other documents to financial aid and you will not be considered eligible for federal aid until this process is completed. Between 30% and 50% of all financial aid applicants are selected for verification and some students are selected due to discrepancies or missing information on their FAFSA after file review. We email students at their CCC student email address and send a secure link for students to view any documents needed to verify their file. As a courtesy, we will also send a letter to you at the address you have listed with CCC. To find out what other documents are required if you are selected, login to Self Service. Click on Financial Aid > Financial Aid Status > Select Current Aid Year > view Unsatisfied Student Requirements to see what we need from you. It is the student's responsibility to respond to our requests for verification documentation. Failure to respond will cause your financial aid file to not be verified, and thus not awarded. What is Federal Work Study and how do I apply? A: The Federal Work-Study (FWS) program provides part-time jobs for students with financial need, allowing them to earn money to help pay education expenses. The program encourages community service work and work related to the recipient's course of study. To qualify for Federal Work Study, students must have a complete and verified financial aid file with remaining need; be enrolled and be in Good or Warning SAP status according to CCC’s SAP to be considered. Students will also go through an interview process with a prospective supervisor. To apply, FWS Applications and job openings are available at our Federal Work Study page. When I register for classes will financial aid hold them? A: Depends. If we have received your FAFSA and you have submitted all required documentation as stated on the Financial Aid Calendar we will award your financial aid which will hold your classes. Please see the Student Accounts page for more information. If for any reason after your file has been verified and it is determined you are not eligible for a grant or loan you will be responsible for payment of your tuition and fees or you will be dropped for non-payment. How do you process financial aid for summer? 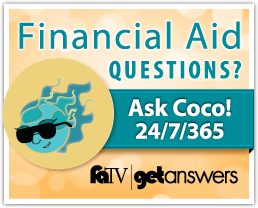 A: Students who wish to receive financial aid in summer must have a complete and verified FAFSA for the current year. Once the student has registered we will automatically award financial aid as long as the student has a complete and verified FAFSA. Pell grants are automatically awarded to student the night that they enroll for summer courses. Summer loans are typically awarded the business day after the student has enrolled in summer classes, as long as the student has turned in a Loan Request Form. Does CCC offer a payment plan or payment deferments? A: Yes. CCC participates in the FACTS program, which allows students to pay their tuition in installments. For more information on this program you may contact the Cashiering Office at 928-226-4237. You may sign up by going to Student Accounts. Can my parent(s) or spouse be given information on my file in person or on the phone? A: You must sign and submit in person a Student Authorization To Release Information form, (Financial Aid Forms) authorizing CCC to release your specific information to the person(s) you have designated. If your parent/spouse wants information in person, their picture ID is still required to verify whom we can release information to regarding your financial aid file. We cannot identify a student/parent/spouse over the phone, which means we will not give out any detailed information on your file. We can only release general information over the phone. Is it free to complete a FAFSA online? A: Yes. The Free Application for Federal Student Aid (FAFSA) is always available at no cost. For the free FAFSA, you must go to https://studentaid.ed.gov/sa/fafsa. Avoid any other websites labeled FAFSA but not affiliated with the U.S. Department of Education. You do not need to pay a company to complete your FAFSA. It is free. How do I know which FAFSA to fill out? A: A FAFSA covers an academic year which includes the fall, spring and summer semester. Example: Completing the 2017-18 FAFSA includes Fall 2017, Spring 2018 and Summer 2018 semesters. I received a Student Aid Report (SAR) by email (or in the mail). What do I do with it? A: Read it to make sure all the information is correct and CCC is listed to receive your FAFSA information. If everything is correct, keep it for your records. If something is incorrect please come see us. How long will it take for financial aid to receive my FAFSA information? A: Generally we receive your FAFSA a week or two after you have submitted it online. You must be admitted to CCC for us to receive your FAFSA information. Be sure you have completed all the requirements with Enrollment Services. A: No, you complete the FAFSA once for every Academic Year (Fall, Spring & Summer). You can complete your FAFSA as early as January 1st which is eight months prior to the start of the upcoming Fall semester. What is this IRS Data Retrieval Tool on the FAFSA? A: When FAFSA asks for income you are given the option to complete it using the IRS Data Retrieval Tool. The IRS Data Retrieval Tool will display your filed tax information from the IRS and allow you to import it into the FAFSA. Using this tool will insert accurate information and could reduce the likelihood of being “selected for verification” (General Financial Aid Questions). For more on IRS Data Retrieval Tool information please visit our Financial Aid Tax Information page. Who's my parent when I fill out the FAFSA? A: Check out this guide to determine whose information should be included on your FAFSA. A: Probably. Your financial aid may be reduced or canceled and you may owe money back. Talk to us before you drop any classes, for more information on how your aid may be affected go to Award Adjustments. You may also be jeopardizing future financial aid by dropping classes. Please review our Satisfactory Academic Progress (SAP) policy and talk to us before you drop any classes. What happens to my financial aid if my class gets canceled? A: You may enroll in another class if classes are available to replace the canceled class. If you do not enroll in a replacement class your financial aid will be adjusted accordingly. How does the 100% refund deadline and deadline to add affect my financial aid? A: The "100% refund deadline" and "deadline to add" are both normally the 5th business day of the semester. If you drop a class before this date, your tuition gets refunded, and per federal regulations we typically need to decrease or cancel your financial aid. Click here for more information on financial aid Award Adjustments. These deadline dates are posted online on the Academic Calendar, located on the Enrollment Services page . Dropping classes can jeopardize your future financial aid. Please consult our Satisfactory Academic Progress (SAP) page for more information. Can I change my major and still get financial aid? A: Changing a major is a normal thing. Financial Aid requires that you be working toward a degree or certificate. If you change your major too many times and start to accumulate too many credits (150% of the credits required for your current degree or certificate), you will lose financial aid eligibility because you have exceeded a normal time frame to complete a degree. For more information, please visit our Satisfactory Academic Progress (SAP) page. We recommend that you visit a counselor in Student Support Services to decide as early as possible on a major. You may contact them at 928-226-4323. You were born before January 1, 1993 (2016-2017) / January 1, 1994 (2017-2018). You’re married as of the date you complete the FAFSA. You have obtained a Bachelors degree. Your are currently serving on active duty in the U.S.Armed Forces (for purposes other than training). You have children who receive more than half their support from you. You have dependents other than your spouse or children who live with you and who receive more than half their support from you. You are an emancipated minor, as determined by a court in your state of residence. You are or were in foster care or were a ward or dependent of the court at any time when you were 13 or older. (You will need to provide documentation to prove this information). You are a self-supporting unaccompanied youth who is homeless or at risk of homelessness. You're a veteran of the U.S. Armed Forces (or will be a veteran as of June 30, 2012, or you attended a service academy and were released under a condition other than dishonorable. You may also visit StudentAid.gov for more information on how to determine your status. With the exception of your birth-date, we typically ask for documentation to validate that any of the above statements are true. We will notify you of any documents necessary to determine if you are dependent or independent. You can see these required documents by logging in to Self Service> click on Financial Aid> Financial Aid Status> Select Current Aid Year > view Unsatisfied Student Requirements. I’ve answered NO to all of the independency questions, but I think I should be considered independent. A: If you cannot answer yes to any of the independency questions but have extenuating circumstances you may submit a Request for Independent Status Appeal, click on the appropriate year Financial Aid Forms page for this document. If you do not meet the criteria for this appeal, you will be required to provide parental information on the FAFSA. I live on my own and my parents do not support me at all. Am I an “Independent” student for Financial Aid? A: Not living with your parents and parents not supporting you does not classify you as an independent student. Per federal regulations, the FAFSA has criteria that determine if you are dependent or independent for financial aid purposes. These regulations are not the same as tax law or health care law. The determination on the FAFSA of your dependency status may not concur with what you think it should be. To be considered independent for financial aid purposes you must be able to answer yes to at least 1 of 13 questions in Step 3 on the FAFSA. Use the Dependency status work sheet to assist you in determining if you are dependent or independent. If your answers to the all of the questions is no, then you are dependent and must report your parents' information. If you are independent, our office may be required to collect supporting documentation from you proving your status.You may also visit StudentAid.gov for more information to determine your status. If I get married after I completed the FAFSA, should I complete a new one with my spouse’s information? A: No. You complete the FAFSA with your marital status as of that day you are filling out your FAFSA. There are circumstances where we can correct your marital status on the FAFSA if you get married at a later date. Please contact our office so that we can better understand your situation. What is an EFC, and what is it for? A: EFC stands for Expected Family Contribution. An EFC is calculated when you submit a FAFSA. Based on the information you reported on the FAFSA, the Department of Education uses a formula to calculate how much you and your family are expected to be able to pay towards your education. Your eligibility for federal and institutional aid is based on your EFC. What is the maximum amount I can make and still receive financial aid? A: That is dependent on how the Department of Education classifies you. If you are independent your eligibility is determined from your income and/or your spouse's income from the previous tax year. If you are dependent your eligibility is determined from your income and your parent’s income from the previous tax year. Fill out the FAFSA to find out. Can I receive financial aid at CCC and another school? A: You may not receive Pell Grant or loans at two schools at the same time. You may be able to enter into a consortium agreement, which allows you to count the credits taken at both schools towards the school that is providing the financial aid. Visit Consortium Agreements for more information on Consortium Agreements. How many credit hours must I be registered in to receive financial aid? A: You can take as few as 1 credit hour per semester and still receive financial aid if you have been determined to be eligible by the Department of Education and CCC. If you are approved for a loan you must be enrolled and attending for at least 6 credit hours per semester. How will I know if my classes count towards my degree or certificate? Sign-in to myCCC > Click on Degreeworks > On your Degreeworks worksheet, look at the classes you have registered for. If your classes do not apply to your degree, they will fall into the section that reads “Not Degree Applicable.” If a class shows up under the “Not Degree Applicable” section, then financial aid cannot be used to pay for it with the exception of any developmental/ remedial coursework (coursework below 100 as well as MAT 111, 121, 122) which is fundable with financial aid. I want to take a couple of classes at CCC so that I can transfer them somewhere else. I don't want to get a degree from CCC. Can I get financial aid at CCC? A: No, not from CCC, but possibly from the other College. Per federal regulations, in order to receive financial aid, you must be enrolled as a regular student in an eligible program for the purpose of obtaining a degree or certificate from the college you are receiving financial aid from. If you are at CCC taking a few classes to transfer to another college, but are not seeking a degree, you are not eligible for financial aid. If you are in this situation, we recommend that you contact the financial aid office at the college that you are pursuing a degree at and ask about your options for being funded financial aid using a consortium agreement from that school in partnership with CCC. You must be seeking a degree or certificate at CCC in order to receive financial aid. What is a Cost of Attendance and Financial Need? A: A standard Cost of Attendance (COA) is an estimate of your educational expenses for the period of enrollment. The COA includes tuition & fees, allowance for books & supplies, housing & food, transportation and personal expenses. Financial need is then calculated by taking your COA minus your EFC (Expected Family Contribution) to total your financial need (COA - EFC = NEED). We use your "need" to determine your eligibility for need based aid such as grants, Federal Work Study and Federal Subsidized loans. Click here to see CCC’s Cost of Attendance. How many times may I repeat a course and still receive financial aid? A: Students who fail or withdraw from a class may repeat the class and receive financial funding again if, and only if they have not been suspended due to Satisfactory Academic Progress. Students who pass a course (A,B,C,D or S) and wish to take it again may do so one time with financial aid funding. If a student attempts to take a passed class for the third time, they will be denied financial aid funding for it. For example, a student earns a grade of D, then repeats the course and earns a grade of F, the student is not eligible to receive financial aid funding a third time in an attempt to improve their grade. What is the Pell Grant Eligibility limit (Pell LEU)? A: Beginning in Fall 2012, students are now limited to 600% Lifetime Eligibility of Pell Grant or 12 full-time semesters (or its equivalent). Students that are currently receiving Pell Grant and would have reached or exceeded their Lifetime Eligibility Used (LEU of 600%) will no longer be eligible to receive Pell Grant. This change affects all students regardless of when or where they received their first Pell Grant. The Department of Education keeps track of your LEU by adding together the percentages of the Pell Grant awards that you received for each award year. To view your LEU, log on to the NSLDS (National Student Loan Data System) Student Access Web Site using your Federal Student Aid PIN. The LEU will be found on the Financial Aid Review page. For more information about Pell Lifetime Eligibility visit the Federal Student Aid website. I see my financial aid is awarded so when will I receive it and how? A: First disbursement of financial aid funds are released based on confirmed enrollment, attendance and participation in your classes which occurs about three weeks from the first day of class. Same rule applies for late start classes. We recommend you sign up for direct deposit so that you do not have to wait for your check to arrive in the mail. Checks will take a few more days to arrive in the mail. Please visit our Disbursement page for more information. I am separated from my spouse (parents are separated if you are a dependent student) so do I have to count my spouse’s information on the FAFSA? A. It depends. In most cases, documentation of a legal separation is required. A document from the court that the separation was filed will suffice, it must show the submission date and have court signatures. In situations where divorce paperwork has been filed with the court but not finalized, our office requires a copy of the paperwork showing the submission date to the court. This documentation will be accepted for one academic year, the following academic year the student must submit final divorce paperwork that includes the court signature(s). In extenuating circumstances, when a legal separation is not possible, a documented informal separation may be accepted. To prove informal separation our office requires evidence that you and your spouse (parents for dependent students) were living apart continuously for the last 6 months of the last calendar year by requesting at least two forms of documentation, such as: rent checks, copies of leases from both parties, copies of utility bills, photocopies of driver's licenses showing different addresses, a letter from a third party certifying that the spouse was living with them, etc. The proof of maintenance of separate households is a key concept in determining informal separation. Students submitting documentation for an informal separation must resubmit current documentation each year. Are Pell Grants available in Summer? Yes, students may receive Federal Pell Grant for a summer term even if they received a full Federal Pell Grant during the fall and spring semesters. Year-round Pell allows students to receive up to 150% of a regular Pell grant award over the course of the academic year so that they can continue taking classes in the summer and finish their degrees faster. With careful planning, Pell Grant recipients may take advantage of this regulation to earn their degree faster. Students should consult with their academic advisor to develop a manageable course load for the shorter summer term. Just because students may be eligible for full-time Pell Grant funds does not mean students are required to carry a full-time load. students must be eligible to receive Pell Grant funds after verification of the FAFSA information. students must be maintaining satisfactory academic progress. students must be enrolled at least half-time (6 credit hours) during the summer term if they have already received a full-time Pell Grant for both the precediing fall and spring semesters. Student A has a zero Expected Family Contribution (EFC) and is eligible for a full Federal Pell Grant for the 17-18 academic year. Student A was enrolled full-time for the fall and spring semesters and received full Pell disbursements. With the new implementation of year round Pell, the student will now be eligible to receive a full-time disbursement in SUMMER if enrolled in twelve or more credit hours. Student C has a zero EFC and is eligible for a full Federal Pell Grant for the 17-18 academic year. Student C was enrolled full-time for the fall semester and received a full disbursement and was enrolled three-quarter time for the spring semester and received a three-quarter time disbursement. With the new implementation of year round Pell, the student will now be eligible to receive a full-time disbursement in SUMMER if enrolled in twelve or more credit hours. Student D has a zero EFC and is eligible for a full Federal Pell Grant for the 2017-18 academic year. Student D was enrolled full-time for the fall and spring semesters and enrolls in three credit hours during the summer semester. Student D is not enrolled at least half-time and therefore is not eligible for additional Pell Grant funds for summer. However, the law allows colleges to award Pell from the beginning of the student’s eligibility for the 2018-19 academic year, if the student has completed the financial aid file. For additional SAP information, please visit our Satisfactory Academic Progress (SAP) page. What does it mean to have to maintain SAP to remain financial aid eligible? A: Per Federal regulations, a student receiving Title IV Federal funds (financial aid) must maintain Satisfactory Academic Progress (SAP). SAP is checked at the completion of every semester by monitoring grade point average (GPA), total credit hours earned and total credit hours attempted (150% rule). Not exceed 150% beyond the total credit hours required to complete their program/major. What does SAP Check Pending in my Self Service Banner status mean? A: This means Financial Aid will be checking your academic progress at the end of the current semester to determine your eligibility for the upcoming semester. Semesters that haven’t occurred yet will usually have this status listed. Pay special attention to the current semester to ensure you’re aware of your status. If I'm on 'Warning' or 'Probation' am I still eligible to receive Financial Aid? A: Yes. but you will need to meet certain criteria to be removed from Warning or Probation and placed into Good standing. Visit our Satisfactory Academic Progress (SAP) page on how to maintain Good financial aid status. A: You are allowed to receive financial aid, but we have placed restrictions and terms that you are required to follow to receive it. We work with academic advisors to ensure your success. As part of an academic plan we may require you to take certain courses, a reduced course-load or require you to meet with advisors throughout the year. You are placed on academic plan so that we can assist you in being successful. A: Students on financial aid suspension are not eligible to receive Title IV aid, which includes grants, loans, federal work study and some scholarships. To return to Good standing you must complete the suspension requirements listed in our Satisfactory Academic Progress policy. If you have extenuating circumstances that led to your suspension status, you may submit a Satisfactory Academic Progress (SAP) Appeal. Why am I on suspension and what can I do to get my financial aid back? A: Financial aid suspension results when a student does not satisfy the financial aid requirements. Students who meet all the Satisfactory Academic Progress (SAP) standards will be eligible for financial aid. Please visit our Satisfactory Academic Progress (SAP) page to read about financial aid SAP standards. To resolve your suspension status, please read “Resolving Financial Aid SAP Suspension” to begin the process for completing the suspension requirements. If you have extenuating circumstances that led to your suspension status, you may submit a Satisfactory Academic Progress (SAP) appeal, which is located on our Forms page..
A: Loans made through a program called the William D. Ford Federal Direct Loan Program are referred to as Direct Loans. These loans are borrowed directly from the U.S. Department of Education. Direct Loans include subsidized and unsubsidized Direct Stafford Loans and Direct PLUS Loans. A: Please visit our Student Loan Information page for the steps you must take to apply for a loan. How much can I request for loans? Freshman (0 - 29 credits) *$5,500 per Academic Year- up to $3,500 of this amount may be in subsidized loans. *$9,500 per Academic Year - up to $3500 of this amount may be in subsidized loans. Sophomore (30+ credits) *$6,500 per Academic Year- up to $3,500 of this amount may be in subsidized loans. *$10,500 per Academic Year - $4,500 of this amount may be in subsidized loans. * These amounts are for an academic year (Fall + Spring + Summer). Loans requested for one semester only must be prorated (or reduced) and will be awarded in two equal disbursements: one at the beginning of the semester, and one at the mid-point of the semester, per Federal Regulations. If you borrow the maximum academic year amounts for which you are eligible in the fall and spring semesters, you will not have any eligibility left for the summer semester. If you are considering summer attendance, budget accordingly. What are the interest rates for Direct Loans and Direct PLUS Loans? What is a subsidized and unsubsidized loan? A: A subsidized loan is awarded on the basis of financial need. You will not be charged any interest until your enrollment drops below 6 credits or you graduate or leave school. The federal government “subsidizes” the interest while you are enrolled in school in at least 6 credit hours. Currently the interest rate on subsidized loans is 5.05%. A: Effective for new Direct Loans for which the first disbursement is made on or after July 1, 2013, Direct Subsidized Loan eligibility is limited to a maximum of 150% of the student’s current academic program. Read for more information on the 150% Federal Direct Subsidized Loan Limit. My parent was denied a PLUS loan. What do I do now? A: If a parent is denied a PLUS loan due to credit, the parent borrower may want to reapply with an endorser who would be willing to cosign. If this is not an option, the student may request to be considered for additional unsubsidized loan. If I had a FFELP loan before how will changes to Direct Loans affect me? A: Your loans may be serviced by different entities, which means you once you leave school you may be paying off two or more servicers. If this happens to you we recommend you contact your loan servicers to see if they can be consolidated with one servicer. Are there additional requirements I have to complete to receive my Direct loans? I received Direct Loans at NAU and signed an MPN (Master Promissory Note), do I have to sign another MPN? A: If your MPN has not expired, no, you do not have to sign a new MPN. Direct Loan MPN’s expire 10 years from the day you sign it online. If you are unsure about if your MPN will work, we recommend that you complete a new one. Please visit our Student Loan Information page. I have now completed the loan requirements, when will I receive my loan money? A: First loan disbursement of funds is based on confirmed enrollment, attendance and participation in your classes which is about three weeks from the first day of class. If you are a first-time, freshman borrower CCC must wait at least 30 days from the first day of class to disburse loan funds, per Federal Regulations. We recommend you sign up for direct deposit so that you do not have to wait several extra days for your check to go through the mail. Please visit the Financial Aid Disbursement page for more information. Why do I need to wait 30 days to get my loan money? A: If you are a first-time, freshman borrower CCC must wait at least 30 days from the first day of class to disburse loan funds, per Federal Regulations. We recommend you sign up for direct deposit so that you do not have to wait several extra days for your check to go through the mail. Please visit the Financial Aid Disbursement page for more information. If I borrowed FFELP loans in the past and then receive a Direct Loan, will my FFELP loan still be deferred? A: Yes. As long as you are enrolled in at least 6 credit hours in college your loan repayment will continue to be deferred. How will loan repayment work if I’ve borrowed FFELP and Direct Loans? A: When you go into repayment, you will have to make two separate payments to both your FFELP lender and U.S. Department of Education unless your FFELP loan has been sold to the Department of Education. You do have the option to consolidate with the Direct Loan program so that you will have only one monthly payment. You can begin the process of consolidating your loans here. I’ve received my loan check but I don’t need that much. Can I return some? A: Yes, you have 14 days to return all or part of your loan. Within the 14 days you are able to return the amount directly to CCC and financial aid will then send that amount back to the Department of Education. The amount that you return will be deducted from the total amount of your loan you have borrowed. Why does my loan come in two disbursements? When will I get the second disbursement? A: Fall and Spring loans must be awarded in two equal disbursements: one at the beginning of fall semester and one at the beginning of spring semester. Single semester loans (fall only, spring only or summer only) will be awarded in two equal disbursements: one at the beginning of the semester, and one at the mid-point of the semester. We do this per federal regulations. If I want to start repaying my loan while I’m still in school, do I pay the school? A: No, once your loan has been disbursed to you it is now in the hands of the Department of Education. You need to contact the Direct Loan Servicing at the Department of Education if you would like to start making payments towards your loans. My FFELP loan (from a bank) just got sold. Now what do I do? I just started going to school again, how do I defer loan repayment? A: In order to delay having to start repaying your loan, your lender needs to verify that you are enrolled in at least 6 credit hours at a post-secondary institution. To complete the enrollment verification process, you must login to Self Service> Student Services> Student Records> Enrollment Verification> choose the current Aid Year and continue to read the instructions. What is a Lifetime (or Aggregate) limit? A: An Aggregate is a limit of the total amount, or total sum, of Stafford loans a student can borrow throughout their entire college experience. The total that an independent undergraduate student can borrow while enrolled in college is $57,500 ($23,000 of that may be in a subsidized loan). A dependent undergraduate student can borrow a total of $31,000 ($23,000 of that may be in a subsidized loan). How do I keep track of my loan history? A: It is a good idea to keep track of the amount of loans you have borrowed throughout college. The National Student Loan Data System (NSLDS), is the U.S. Department of Education’s database for student financial aid records. NSLDS allows students to manage their student loans and grants online. What is loan default and how will it affect me? A: The combining of a number of loans into a single new loan. Consolidation may lower your monthly payment with different interest rates and typically extends your repayment period. However, there could also be some disadvantages. To consolidate, you must be in your six-month grace period or in repayment of your loans. Please visit Direct Consolidation Loans for more information.